In the world we live in today, anyone from any age group can become an entrepreneur provided you have the will. 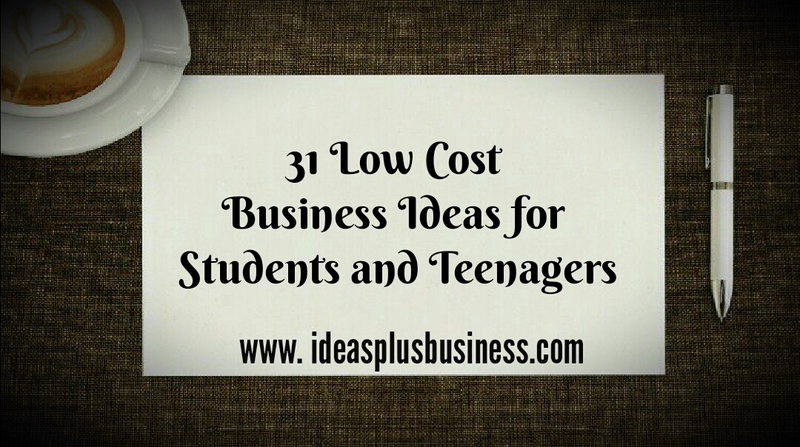 There are many low cost business ideas for students and young entrepreneurs out there. Mark Zuckerberg started Facebook as a teenager and grew it into a multi-billion dollars industry within a short time. If he can do it, you can do it at that tender age, then your age does not matter. In fact, age doesn’t matter in business. Where there is a will, there is a way. There are teenagers who wants to start making money online and offline but don’t know what to do. And I have read about some teenagers who have successfully started several companies online and offline. No matter what you want to do, just believe in yourself. Here is a good list of low-cost business ideas for teenagers and students that has been categorized into online and offline business. It is important to note that most businesses (if not all) can be done offline and online. With the advent of powerful mobile phones, you can easily make and edit short videos with your phone which can be fully monetized on YouTube for free. Your videos can be comical, dramatic, strange, and odd or even a new dance skill you know. Just be creative. Some companies need teenagers and students to talk about their products on camera. Approach these companies with short video samples of what you can do. There are hundreds of companies that are ready to pay you lots of money to look good. You can make money from training other people’s dogs. There are thousands of dog owners who are ready to pay good money to help them train their dogs. You can do this after school hours in the evening and on weekends. Dog walking also have the added advantage of keeping your body in top shape. Look around you and approach dog owners with your offer. You can make short handwritten cards to advertise your services in your neighbourhood. Most people tend to live a boring life after retirement. Lots of retired men and women are looking for something fun and exciting to do every day. If you love people, especially those that are old and you have a great deal of patience and you also live in a place where lots of retirees live, then this is for you. Be creative and you on your way to great business. This is an opportunity to network and build genuine relationship both on a personal and business level. I can bet my lunch money that you have at least one active social media account. You can easily turn your knowledge into money by helping other people and small companies promote themselves. You can start making homemade beauty products like soaps and perfumes with your own unique style. You can start a small local company from this and you would be surprised that people will pay you for your products. You can easily play the student card on them since people are naturally inclined to support students. People love convenience and are willing to pay good money for this. You can give be the one person to provide convenience to people in your neighbourhood. You can save someone a couple of hours of their days or weekends and get paid for your services. Are you skilled in other languages other than your native language? You can make good money from this by offering language translation services to individuals and companies both offline and online. There are several business who wants to expand in other countries and they are ready to pay people who can speak those languages. Make a good business out of your skills today. You can start your services offline or use freelance services like Upwork to seek out clients online. If you are a fitness specialist who knows a lot about the human anatomy, the gym and at the same time have the perfect body to show your skills. There are thousands of people around you who are ready to pay you to share your knowledge and expertise with them. Who doesnt want an amazing body? This is simple and straight forward. You help create awareness for a green world. Companies will pay you to help them campaign for a greener environment. You will be paid to plant trees. This is an age-long business you can do if you love and enjoy writing. It is much easier today to self-publish a book than you can imagine. With the emergence of ecommerce stores like Amazon, you can easily sell your book to a massive global audience online and offline. This is not a one person business. You can start your own professional security business with a few of your friends. The risk is high and can only be pulled off successfully if you work as a team. There are many wealthy and famous people out there who will pay you good money for their personal security. Looking good is good business and people will pay you lots of money for their convenience. You can open your own travelling salon on the go. Go to other peoples homes and do their hair which results in more money in your pocket since you wont have to rent a space of your own. This is a little risky. Do this if only you can verify the identity of your clients and always let your family and friends know where you are headed to at every point in time. You can teach people in your neighbourhood music lessons if you are good at music and play musical instruments. You can start your own freelance music training school where you can offer custom music lessons to people in their homes for a fee. You can even go further by making short video lessons that you can sell online for a fee. I was once in a local soccer academy created by coaches who were teenagers and students who taught me how to perfect my soccer skills. I joined this academy for a fee and these people were making good money with their coaching skills. If you enjoy a certain sport, you should consider making money from it by starting your own sport academy in your neighbourhood. You will paid whatever price you charge if you can convince those around you that you are good. Sports coaching is a good business no matter the level you are operating from be it local or elite. Blogging is one of the best ways to make money online if and only if you blog right. You can position your blog to earn decent money when you are able to provide solutions to people’s problems on your blog. This is how to build a blog around your business. You can start by choosing a particular topic you really enjoy talking about and start writing about everything you know about the topic. This will draw attention to your blog. You can make money from your blog by offering a service or just by advert placement. And you can do this at your own hours. You can start a counselling business online right from the comfort of your home using your computer, webcam or online counselling forums. Improve other peoples lives and help make the world a better place. You can make good money doing this. Turn your passion and hobby in a money making machine. Almost every teenager and students today have hundreds of funny, crazy and hilarious pictures on their mobile phones. You can easily sell your pictures online and make passive income for years to come. You can help small businesses and individuals design and setup their business and personal websites respectively. You dont have to be a great programmer to learn this skill. You can use any content management system such as WordPress, Joomla or any other CMS you are comfortable with to design a great website. The mobile application is a multibillion dollar industry. Every business is going mobile and mobile apps have never been so popular. If you fancy coding and have some programming skills, this is the best time to take a cut of your own millions from this industry. If you are a creative genius, then you should start your own logo designing company either offline or online. A lot of individuals and companies spend large amount of money on creating a perfect logo. This is yours for the taking. Keeping pets can be very tasking for most pet owners. You can provide your pet grooming service to pet owners in your neighbourhood if you love pets or even animals generally. You can start your own mobile pet grooming service in your neighbourhood. Creativity is the master of invention. Be creative and get those big bucks coming in. Don’t be surprised with this addition. There are still millions of people in the world today who don’t know how to do the basic things on their computer such as using word processors, checking mails, downloading from the internet etc. Some of these people are afraid of learning outside because of their ego or (fill in the gap). Make yourself available in your neighbourhood and offer to teach them these skills at the comfort of their homes for a fee. You will be amazed by the large sum you will make from teaching other people the basic computer skills you take for granted. Be creative in your approach. There are several companies who are making millions of dollars every year just by writing resumes for people. This is because a good resume is one of the most important papers in a persons life and no one wants to mess it up. If you can write a good resume, you should also consider offering this as a service in your neighbourhood. Ask around your neighbourhood and make yourself available for this service. If writing is your area of interest, then you can make money in the business niche by writing business proposals for small businesses in your neighbourhood. You can take your skills online to a more global audience. You will earn a lot of money in this niche. Many people have great treasures lying useless in their garages. If you are good at making sales and negotiating deals, you can approach people in your neighborhood with a convincing offer to help them sell stuffs in their garage and get a percentage of the total sales made in return. Don’t worry about the rejections, it is a common thing associated with sales. Be persistence and make sure to earn their trust in the process. Your results should speak for you in the long run. Have you ever wanted a personalized cap, shirt or a piece of jewelry? It is the next cool thing to ice. I have always wanted one of those. It makes me feel special and unique from the crowd. If you can offer me this service, I am ready to pay you good money for this. Dont forget that there is huge money potential in this niche for you. Just be creative in your approach. Do you have a sound background in medicine or health and you genuinely love taking care of people? Having a home-based health care is something most people are willing to pay for. This business is good for you if you are a teenager or student who is studying health related professions. Your knowledge of a particular subject can earn you good money as a teenager or student. You can offer extra-murals to your friends and fellow students in their homes. Your knowledge of science, mathematics and other technical subjects can fetch you good money. What about selling seasonal goods like Christmas decorations, Halloween costumes, Valentine gifts etc. You can easily start selling these items in their peak season. Establish yourself as a specialist and you are in for a good business all year long. You have unlimited opportunities in the business world as a teenager or student. Dont let your age hinder you from being the next big thing in the entrepreneur world. Think outside the box. Break the box and remove all limitations from your path. Always remember that your imagination equals possibilities. I would love to hear more about you and your business. What do you do and how can I help you? Also, kindly suggest to me related topics you would want to read about. By the way, do you need help creating content that resonates with your audience, increase your blogs visibility online, or grow your email list? I can help you with that.